Our Conductive Epoxy is ideal for creating a firm and conductive bond between our Jigging Wire and the item you’re brush plating or electroforming. 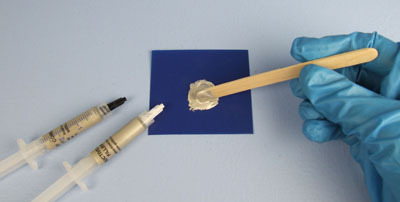 It’s great for plating and electroforming on non-conductive materials. 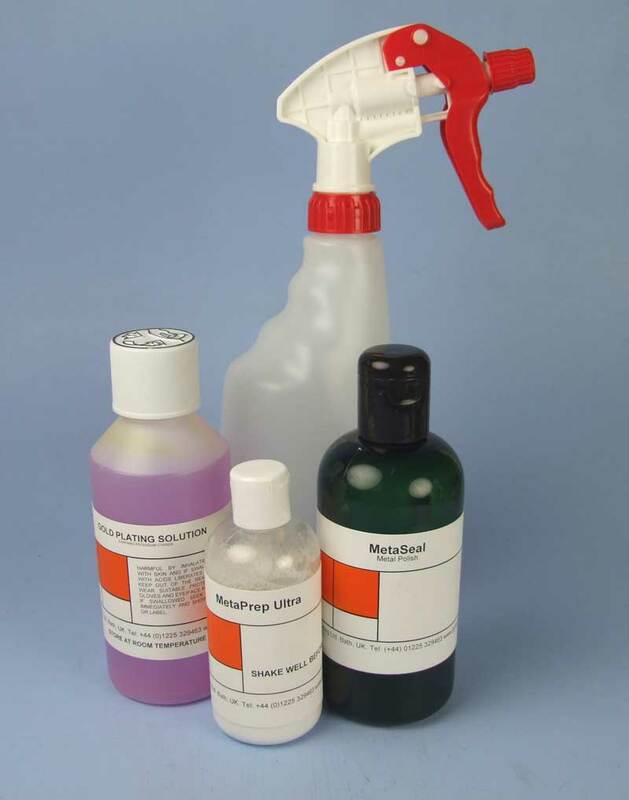 Can also be used to fill in minor dents in metal surfaces before plating. 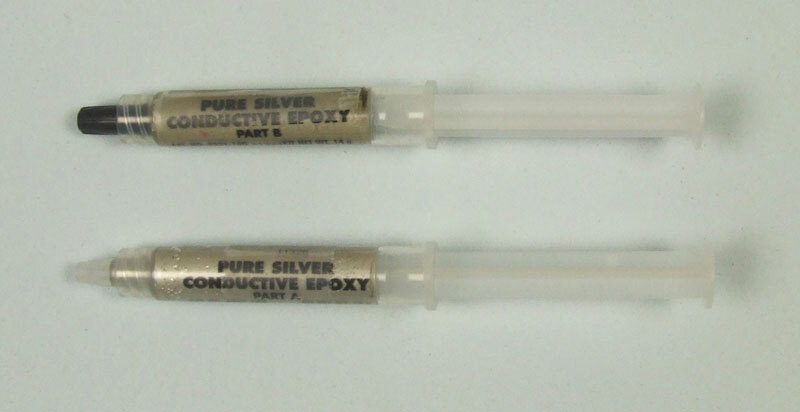 Syringes of A and B Conductive Epoxy, a small square of plastic and a mixing stick. Squeeze out an equal amount of A and B and mix with the mixing stick. Remember to put the right cap back on the right syringe, immediately after use! Place a small amount of the mixed Epoxy where you would like you jigging wire to join the item you’re elctroforming. 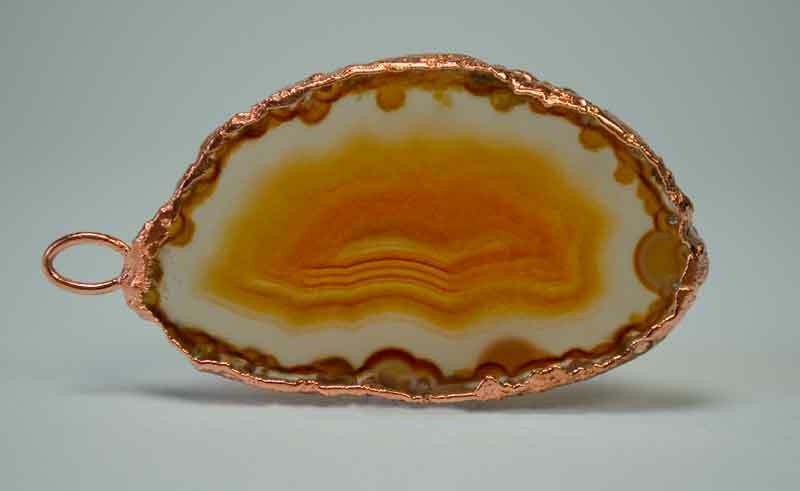 With the electroformed agate example to the right, the copper jump ring was stuck to the Conductive Paint with the Conductive Epoxy after the paint had been applied to the rim of the slice and had dried. The jump ring could then be used as the elctrical connection for electroforming, as well as acting as the mechanism for hanging the agate slice on its silver chain. Setting times for the Epoxy will vary according to the temperature you are working in. They are as follows; at 24ºC – 4 hours, 65º – 10 minutes. Once you have mixed the Epoxy, use within 10 minutes. Once the Epoxy is fully hardened, you can smooth it down with wet and dry paper. Start with a grade 600 then move up to 1000 and finish with 1500. You need to use water with the paper and a little soap increases the fineness even more. You can then machine polish to achieve a perfectly smooth result. Please refer to the pages on machine polishing in our manual for guidance. Once the Conductive Epoxy Resin is fully set and you’ve done any necessary sanding, you are now ready to plate over your join. If you’re brush plating, we recommend plating a layer of PP Copper first, then a barrier layer of white bronze or nickel if you wish to gold plate or if you intend to silver plate you don’t need a barrier layer and you can plate straight after with silver. If you’re planning on electroforming, please see the section on electroforming in this manual. Store it under refrigerated conditions, 2 – 3 years.